This temporary residence that we call Earth is a violent, cold world, especially for a toddler. One day you are innocent, running amuck and diverting obstacles and danger without even being aware of their presence. Your greatest daily worry is that someone may knock your Thomas train off of its miniature little tracks. Your biggest decision of the moment is whether to dig gigantic holes in the plethora of mole mounds scattered throughout the yard or to practice the fine art of precision bubble-blowing. My little man finally met his match. How was he to know that his slight two-year old body was no match for the onslaught of three-, four- and five-year-olds (not to mention the one twenty-seven year old), rolling like an unstoppable locomotive down the grassy embankment in a heap of arms, elbows and knees? Connor's cry of pain temporarily overshadowed by the callous and unknowing shrieks of laughter, he experienced in that moment the loneliness and betrayal reserved for those sailors lost adrift at sea or the lone mountain-climber wandering, having been separated during a blinding snowstorm from his party, his security, his future. Connor has a broken arm - fractures in both bones of his forearm. Quite a bummer, to say the least. 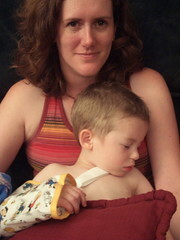 He is in a splint and sling now ("Take it off, Mommy! "); tomorrow we will visit the orthopedic surgeon to determine how it needs to be set and cast. Poor guy. When Douglas had his tonsils out the worst part was having his hand-wrapped (to protect the IV from prying toddler fingers). I suspect that sling will get very frustrating. Good luck to you! Hunter says "hi Conner, you broke you arm." oh nooo. I really like the way you told your sons story. You should think about being a writer. Ok so that is one more thing you have plenty of time to do. Seriously, I just see me going through the same things with Jonah. I don't wish any ill will upon the Connanater, but it is good for Jonah to have a studly example of how to take a lickin and keep on ticken. Conner is definitely in myu prayers. And welcome to the neighborhood.